Often times, the difference between a healthy and an unhealthy saturated fat or vegetable oil has to do with the fatty acid and phytochemical composition. For instance, unrefined coconut oil has a very different fatty acid make up than conventional bacon or heavily processed palm oil. Additionally, “virgin” coconut oil and many other plant-based lipids usually contain naturally occurring antioxidants. A popular example of this model is extra virgin olive oil (EVOO). Using this as a jumping off point, I decided to look into the relative merits of camellia oil vs. EVOO. It was interesting to find that only one placebo-controlled study has investigated camellia oil in human subjects. In it, a group of women with high cholesterol were given either 45 ml (1.5 oz)/day of camellia oil or soybean oil. Over the course of 8 weeks, the participants were fed three meals cooked in one or the other oils. At the start and end of the trial, blood samples were taken to determine changes in various cardiovascular risk factors. The authors of the study report that the women in the camellia oil group demonstrated lower levels of oxidative stress (malondialdehyde -11.2% and oxidized LDL cholesterol -8.7%) and reduced systemic inflammation (C-reactive protein -12.3%). Based on these preliminary findings, the conclusion of the trial states that “camellia oil consumption may reduce cardiovascular risk”. While promising, it should be noted that the majority of research involving tea seed oil has been carried out in animal and in-vitro experiments. Most of the published data describes positive results including cardiovascular, gut and liver protection. 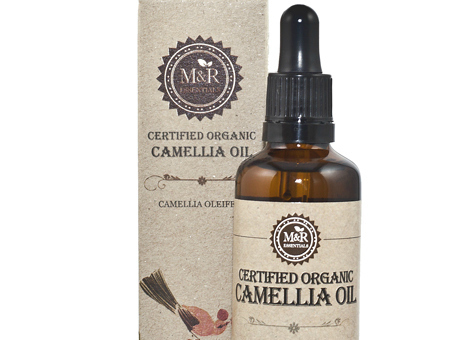 Even so, based on what is currently known, I don’t yet suggest going out of your way to track down camellia oil. Presently, there are many more reasons to recommend extra virgin olive oil. And, the research supporting EVOO just keeps getting stronger. The latest batch of studies confirm that EVOO-rich diets decrease oxidative stress, metabolic risk (diabetes and pre-diabetes) and, may even, benefit difficult to manage conditions such as fibromyalgia. J AOAC Int. 2016 Mar-Apr;99(2):489-94. Combination of Analytical and Chemometric Methods as a Useful Tool for the Characterization of Extra Virgin Argan Oil and Other Edible Virgin Oils. Role of Polyphenols and Tocopherols. 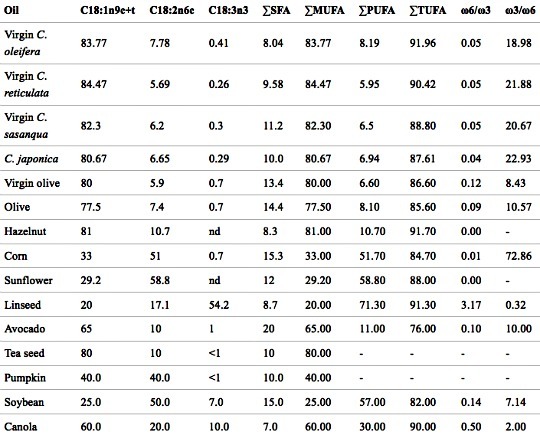 Analysis of phenolic profile and tocopherol fractions in conjunction with chemometrics techniques were used for the accurate characterization of extra virgin argan oil and eight other edible vegetable virgin oils (olive, soybean, wheat germ, walnut, almond, sesame, avocado, and linseed) and to establish similarities among them. Phenolic profile and tocopherols were determined by HPLC coupled with diode-array and fluorescence detectors, respectively. Multivariate factor analysis (MFA) and linear correlations were applied. Significant negative correlations were found between tocopherols and some of the polyphenols identified, but more intensely (P < 0.001) between the γ-tocopherol and oleuropein, pinoresinol, and luteolin. MFA revealed that tocopherols, especially γ-fraction, most strongly influenced the oil characterization. Among the phenolic compounds, syringic acid, dihydroxybenzoic acid, oleuropein, pinoresinol, and luteolin also contributed to the discrimination of the oils. According to the variables analyzed in the present study, argan oil presented the greatest similarity with walnut oil, followed by sesame and linseed oils. Olive, avocado, and almond oils showed close similarities. J Med Econ. 2016 Oct 11:1-11. Estimates of the direct and indirect cost savings associated with heart disease that could be avoided through dietary change in the United States. AIMS: Diets high in saturated fat are associated with elevated risk of heart disease. This study estimates the savings in direct (medical care) costs and indirect (job absenteeism) costs in the US from reductions in heart disease associated with substituting monounsaturated fats (MUFA) for saturated fats. MATERIALS AND METHODS: A four-part model of the medical care cost savings from avoided heart disease was estimated using data on 247,700 adults from the 2000-2010 Medical Expenditure Panel Survey (MEPS). The savings from reduced job absenteeism due to avoided heart disease was estimated using a zero-inflated negative binomial model of the number of annual work loss days applied to data on 164,577 adults from the MEPS. RESULTS: Estimated annual savings in medical care expenditures resulting from a switch from a diet high in saturated fat to a high-MUFA diet totaled ∼ $25.7 billion (95% CI = $6.0-$45.4 billion) in 2010, with private insurance plans saving $7.9 billion (95% CI = $1.8-$14.0 billion), Medicare saving $9.4 billion (95% CI = $2.1-$16.7 billion), Medicaid saving $1.4 billion (95% CI = $0.2-$2.5 billion), and patients saving $2.2 billion (95% CI = $0.5-$3.8 billion). The annual savings in terms of reduced job absenteeism ranges from a lower bound of $600 million (95% CI = $100 million to $1.0 billion) to an upper bound of $1.2 billion (95% CI = $0.2-$2.1 billion) for 2010. LIMITATIONS: The data cover only the non-institutionalized population. Decreased costs due to any decreases in the severity of heart disease are not included. Cost savings do not include any reduction in informal care at home. CONCLUSIONS: Diets high in saturated fat impose substantial medical care costs and job absenteeism costs, and substantial savings could be achieved by substituting MUFA for saturated fat. J Gerontol A Biol Sci Med Sci. 2016 Oct 5. Telomerase RNA Component Genetic Variants Interact With the Mediterranean Diet Modifying the Inflammatory Status and its Relationship With Aging: CORDIOPREV Study. BACKGROUND: Leukocyte telomere length (LTL) attrition has been associated with age-related diseases. Telomerase RNA Component (TERC) genetic variants have been associated with LTL; whereas fatty acids (FAs) can interact with genetic factors and influence in aging. We explore whether variability at the TERC gene locus interacts with FA profile and two healthy diets (low-fat diet vs Mediterranean diet [MedDiet]) modulating LTL, glucose metabolism, and inflammation status in coronary heart disease (CHD) patients. METHODS: Inflammation status (high-sensitivity C-reactive protein [hsCRP], glucose metabolism-glucose, insulin, and glycated hemoglobin [HbA1c], and homeostasis model assessment of insulin resistance [HOMA-IR]), LTL, FAs, and single nucleotide polymorphisms (SNPs) of the TERC gene (rs12696304, rs16847897, and rs3772190) were determined in 1,002 patients from the CORDIOPREV study (NCT00924937). RESULTS: We report an interaction of the TERC rs12696304 SNP with monounsaturated fatty acid (MUFA) affecting LTL (p interaction = .01) and hsCRP (p interaction = .03). Among individuals with MUFA levels above the median, CC individuals showed higher LTL and lower hsCRP than G-allele carriers. Moreover, MedDiet interacted with TERC rs12696304 SNP (p interaction = .03). Specifically, CC individuals displayed a greater decrease in hsCRP than G-allele carriers. These results were not adjusted for multiple statistical testing and p less than .05 was considered significant. CONCLUSIONS: Our findings suggest that the TERC rs12696304 SNP interacts with MUFA improving inflammation status and telomere attrition related with CHD. Moreover, the MedDiet intervention improves the inflammatory profile in CC individuals compared with the G-allele carriers. These interactions could provide a right strategy for personalized nutrition in CHD patients.